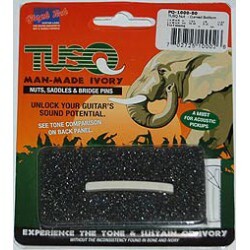 TUSQ produces more harmonics in the mid and upper range of the guitars. TUSQ nuts, saddles and bridge pins have harmonically rich tone, without the inconsistency found in ivory, bone or other natural materials. Bone and Ivory have hard and soft spots (grain) throughout each piece, hampering consistent transfer of vibrations to the guitar top. TUSQ has been designed to transfer the right frequencies more efficiently from the strings to the guitars body.